Listed here is a summary of key events in microprocessor history up to the Pentium processor. 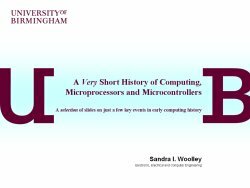 PowerPoint slides on a selection of some key events in early computer history. 1940: Russell S. Ohl's silicon junction demonstration. Ohl used piece of silicon with an electrical lead at each end. He completed the circuit by shining a light on the non-conducting silicon between the wires. In growing silicon crystals he found that some conducted best when their charge carriers were negative (he called them 'n' type) and some when positive ('p' type). 1947: Shockley, Brattain and Bardeen discovered that Ohl's semiconductor could be made into an amplifier by embedding two closely-spaced metal point contacts in a germanium crystal. They won the Nobel prize for the invention of the transistor. 1950's: Shockley leaves Bell Labs to establish Shockley Labs in California. Some of the best young electronic engineers and solid-state physicists come to work with him. These include Robert Noyce and Gordon Moore. 1957: Shockley turns out to be a tyrant; paranoid and unpredictable. Led by Noyce, eight of the best engineers (all under 30) leave to form Fairchild Semiconductor, a subsidiary of Fairchild Camera and Instrument. 1969: Intel is a tiny start-up company in Santa Clara, headed by Noyce and Moore. Ted Hoff joins as its 12th employee. Federico Faggin of Fairchild invents a new kind of MOS process - silicon gate technology. Intel adopts it. Fairchild and Motorola are large semiconductor corporations. Hewlett-Packard is a major manufacturer of the new electronic "pocket calculators". Busicom is a medium-sized Japanese calculator company. It is generally recognized in the electronics industry that it is theoretically possible to use the new MOS semiconductors to put all the functions of a calculator onto one chip. SSI has been replaced by MSI and industries are looking toward LSI and VLSI. 1970: Busicom place an order with Intel for custom calculator chips. Intel has no experience of custom-chip design and sets outs to design a general-purpose solution. Ted Hoff and Stan Mazor (who famously said "Never trust a computer you can't lift") work together in Intel's labs designing a 4-bit logic chip (cpu) with ROM, RAM, shift registers and port connections for Busicom. 1971: Hoff and Mazor have difficulty in translating architectures into working chip designs and the project runs late. Faggin leaves Fairchild for Intel and solves the problems in weeks. The result is the Intel 4000 family (later renamed MCS-4, Microcomputer System 4-bit), comprising the 4001 (2k ROM), the 4002 (320-bit RAM), the 4003 (10-bit I/O shift-register) and the 4004, a 4-bit cpu. Unfortunately, manufacturing errors introduce further delays and Busicom demand renegotation of the contract for a delivery which is now 12-months late, and in their opinion, wildly overpriced. The biggest marketing mistake of the century? Busicom sign away exclusive rights to the 4000 series for everything except calculators. It could have owned the microprocessor. Intel now own their new product (they had previously expected to make their money on the supporting memory products) and they struggle to support it. Ted Hoff works hard to convince the engineering community of the benefits of microprocessors. June - Texas Instruments (TI) announce a "CPU on a chip" - it is announced "dead on arrival" sometime later. 1972: Faggin begins work on an 8-bit processor, the Intel 8008. The prototype has serious problems with electrical charge leaking out of its memory circuits. Device physics, circuit design and layout are important new skills. The 8008 chip layout is completely redesigned and the chip is released. There is a sudden surge in microprocessor interest. Microprocessor-related articles begin to appear in electronics publications. Intel's 8008 is well-received, but Faggin listens to customer suggestions as he works on an enhanced version. Users want increased speed, easier interfacing, and more I/O and instructions. The video game industry gets underway as Nolan Bushnell starts his own company, Syzygy, later renamed ATARI. Bushnell had studied the first 8-bit microprocessors and uses them to duplicate an arcade version of the computer games he had used on his University's computers. His first attempt at a video game, Computer Space, is too complicated and fails. In his next attempt he decides to "build a game so mindless and self-evident that a monkey or its equivalent (a drunk in a bar) could instantly understand it". PONG, the electronic equivalent of Ping-pong, was a great success. 1973: There is a flood of articles on microprocessor technologies and applications, in the electronics press. 1974: The improved 8008, the Intel 8080, is released. It is perhaps the single most important product of the 20th century. Faggin said "The 8080 really created the microprocessor market. The 4004 and the 8008 suggested it, but the 8080 made it real". Faggin leaves Intel to start Zilog. Motorola announced their NMOS, 5 volt, 6800. Though bulky, and fraught with production problems, their 6800 is a brilliant design. Motorola was founded in 1928 and made car radios. They had introduced transistors in the 1950s and had decided to make a late but serious effort in the microprocessor market. Hewlett-Packard (HP) introduce their first scientific calculator, the $395 HP-35. It is followed by the HP-45 and HP-65. Slide rules and tables will soon become obsolete. 1975: General Motors approach Motorola about a custom-built derivative of the 6800. Motorola's long experience with automobile manufacturers pays off and Ford follow GM's lead. New cars today often contain many microprocessors and controllers, for example, the BMW 325 contains 100. An advert in Popular Electronics describes an $800 ready-to-build computer kit based on the Intel 8080. At this time the smallest commercial computers are selling for $30,000. Steve Wozniak builds a computer in his garage with a $20 8-bit processor from MOS Tech. Inc. (absorbed by Commodore in 1977). This was the prototype for the Apple 1. Texas Instruments (TI) had learnt from their early failure and invested in IC fabrication and assembly. In 1975, they bring out their first range of scientific calculators leading to the TI-58 and the TI-59. Though they are behind in the microprocessor market, they had brought out a microcontroller, the TMS1000, in 1974. They would introduce their first DSP chip in 1982. TI used aggressive, cost-cutting marketing strategies which destroy much of the competition. Prices of electronic goods fall rapidly. Electronic calculator prices fell from $150 to $13 in 6 years. Digital watches were to fall from $100 in 1977 to less than $10 in 1979. Dramatic price falls and fierce competition would continue in the industry. 1976: Intel introduce an 8-bit microcontroller, the MCS-48. They ship 251,000 in this year. Zilog announce their 8-bit, Z80. Benchmark tests showed it to be better than anything from Intel. TI gets serious and file patents. Intel and others are taken by surprise, they had thought that general-purpose ICs were not something that could be patented. patent battles, head-hunting and industrial espionage ensue. Later, Zilog design plans are found in National Semiconductor labs. Zilog sues for theft of trade secrets. 1978: Intel announces the 16 bit, 16-bit bus 8086, based on the 8080; it has 10 times the performance. 1979: There are two basic ways to improve performance; expand bus width or expand processor instruction capacity. It is easier and cheaper to maintain instruction sets and increase bus width. Motorola did this with the introduction of a 16-bit bus version of the 8-bit 6800, the 6809. Changes can, however, be made the other way around. If companies want to fill a 'hole' in their product range with a budget version of a premium part, they may elect to cut bus width. Motorola also announce a 16-bit 68000. Indisputably, the best microcontroller on the market at the time. It would be used in the Apple Macintosh launched in 1984. Electronics engineer, Chuck Peddle, famously worked on the 68000 at Motorola before leaving for MOS Technology, where he headed the design of the 650x family of processors. This included the 6502 that went on to be used in the Apple II, the Commodore VIC-20 and the Nintendo Entertainment System. He later went on to design the Victor 9000 personal computer. Zilog announce a 16-bit Z8000. Another great design but Zilog struggle to provide good support, they are inexperienced and have only a few hundred employees; Intel now has over 10 thousand. However, Intel are still working, after 5 years, on a huge 32-bit design. It is ahead of its time. Intel look seriously at the competition, both Motorola and Zilog have better products on the market. They implement 'Operation CRUSH' - a huge campaign with a focused and trained work force providing customer support, complete solutions and long-term product support. CRUSH proves an excellent strategy and the 8086 becomes the de facto standard. This success helps finance additions to their product range, one of which is the bus width reduced 8088, a 16-bit (8-bit bus) microprocessor. 1980: Intel introduce the 8051, an 8-bit microcontroller with on-board EPROM memory. They ship 22 million (compared with 251,000 MCS-48's in 1976) and 91 million in 1983. 1981: IBM, having seen Apple's success recognise a new personal computer market. They choose Intel over Motorola and Zilog (and their own proprietary processors) because of Intel's long-term commitment to the 8086 line. Intel is back on top as IBM selects the Intel 8088 for their PC, introduced in August. IBM and PC clone makers buy millions of Intel 8088 chips. 1982: Motorola bring out the 68010 and the 6805 (a microcontroller based on the 6800). Intel bring out the 16-bit 80286 for the IBM PC ATand compatible computers. It has critical weaknesses, most notably in virtual memory support. The newest 'killer' application software, Microsoft Windows, needs a more powerful processor. IBMs service to the computer industry was to make the PC 'open', this meant clone makers could compete with IBM-compatible PCs. New companies such as Compaq and Dell (both from Texas) fare well, as do South Korea's Leading Edge and Taiwan's Acer who produce PCs with AT performance at half the price. IBM can't keep up. Intel bring out 16-bit microcontrollers, the 8096, 80186 and 80188. 1984: Motorola bring out the 68020, a CMOS 32-bit microprocessor with 200,000 transistors. 1985: Intel announce the 80386 a 32-bit microprocessor, of 275,000 transistors. It was the world's best performing processor at this time. 1986 Compaq are the first company to bring out a 386 PC. IBM's 386 PC, the PS/2, does not come out for another year. However, IBM remain the top PC seller, only topped by Compaq in 1994. 1987: Zilog bring out the Z280, a 16-bit version of the 8-bit Z80. Zilog's marketing has improved; its products are cheap ("less than the price of a Big Mac" their adverts proclaim). Zilog identify a niche market in Z80 support, recognising that many engineers prefer the Z80 because they used them in college. 1989: Intel bring out a bus-reduced 32-bit, 16-bit bus 80386SX as an inexpensive way to lure customers into the 386 market. 1990: 386 computers are selling like hot cakes. Intel cannot keep up with the demand and has to ration its chips for 6 months. 1991: Intel launch the 'Intel Inside' labelling campaign. 1992: The 32-bit (64-bit bus) PowerPC 601 is announced. It is the result of a joint venture between Motorola, IBM and Apple. It has 2.8 million transistors. Apple use it in the PowerMac and PowerPCs eventually follow (IBMs PowerPC is delayed until 1995). 1993: Intel introduce the 3 million transistor, 32-bit, 64-bit bus, Pentium processor (a copyrightable name). It has five times the power of the 486 for the same price. 1994: Thomas Nicely, a Virginia college professors, has division problems and uncovers the Pentium bug. News spreads quickly on the internet. After an initial delay, Intel apologise and offer free replacement of all chips.